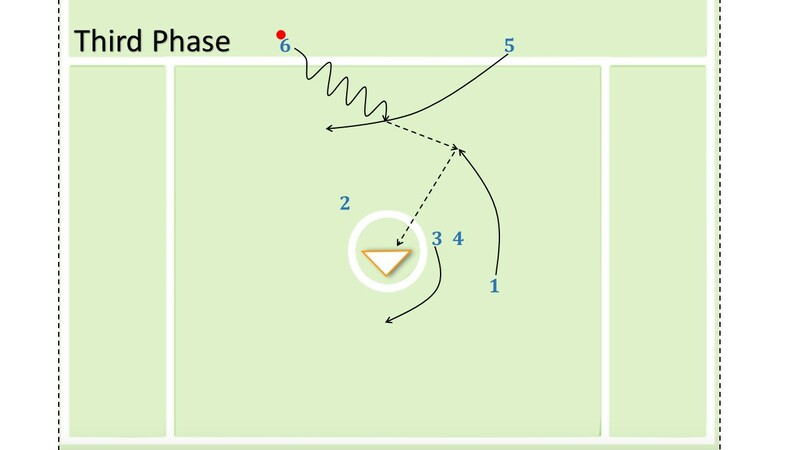 Objective: To create space and a scoring opportunity led by clearing space allowing a midfielder to sweep. - Player 5 and 6 are midfielders covered by shorts sticks. - Player 4 is a midflieder covered by long-stick. - Players 5 and 6 begin play with ball reversal up top. - Player 5 clears through after passes to player 6. - Player 1 cuts behind and screens for a possible quick shot. - Player 6 sweeps lefty looking to shoot or pass to player 1. - If player 1 receives the ball the should shoot. - Player 3 rolls behind the “X”. - Player 2 stays on back pipe, and is back up. - Player 6 supports up top. - Player 2 receives a pass from player 1. - If player 2 is able to shoot, he shoots. - If player 2 is not able to shoot, passes the ball to player 3.